Black Creek is situated among the rolling hills and quiet bluffs of central Mississippi. We offer 2800 acres of privately owned farmland in the heart of deer and turkey hunting country. Our four bedroom private lodge comfortably sleeps 11 hunters. And, since we think there’s nothing like the excitement of watching a child enjoy wildlife and the outdoors, we promote a family atmosphere. 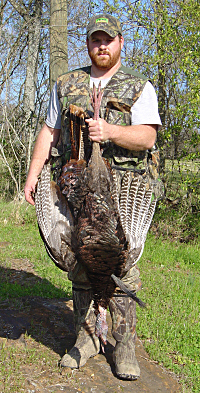 Black Creek Outfitters provides great hunts complemented by true Southern hospitality, home-cooked meals and comfortable, informal accommodations. Package rates include lodging, hunting, and 2 meals per day. In addition, we ‘dlove you to bring your kids. Their stay is half-price when they accompany an adult. Hunt from shooting houses and stands located in hardwood bottoms or pine plantations, at the edge of cutover or near creeks, ponds, our lake or row crop areas. Our property’s wide variety of wildlife habitat combined with over 30 years of aggressive wildlife management and permanent food plots entice trophy deer and wild turkey populations to call Black Creek home. Whether you are looking for a trophy Whitetail buck or just a relaxing outdoor getaway, Black Creek Outfitters will deliver. We’ve arranged for everything so all you have to do is come and enjoy our wonderful property and comfortable surroundings. Black Creek Outfitters has 25 years of experience. © 2009 Black Creek Outfitters. All Rights Reserved. Site by Fox Web Co.